My Account Join the panel! 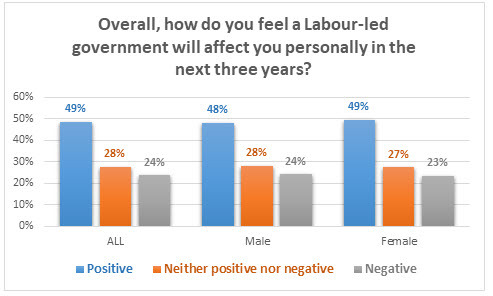 Nearly twice as many New Zealanders are feeling positive rather than negative about the effect the new Labour-led government will have on them personally. 28% say the affect will be neither positive nor negative. The numbers do not vary by gender. However, increasing age drives changes in positive and negative feelings. 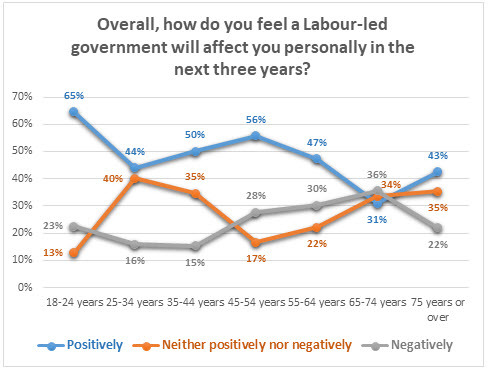 65% of those aged 18-24 feel the new government will impact them positively, while among those aged 75 or older this falls to 43%. The group aged 65-74 years is the only one in which more feel negative than positive. Which party people voted for in September is also strongly driving people’s outlooks. 92% of Labour voters and 91% of Green voters are feeling confident the new government will be good for them personally. 57% of New Zealand First voters feel positive, 20% negative, 24% neither positive nor negative, indicating the party’s voters are more satisfied than dissatisfied with the decision to form a coalition with Labour, supported by the Green party. 64% of Maori Party voters are positive, 9% negative. However, only 13% of National and 24% of ACT voters are feeling positive. 54% of National voters are feeling negative, while a large 33% say neither positive nor negative. Confidence the new government will affect them positively is as high as 77% among labourers, agricultural and domestic workers (12% negative), 76% among teachers, nurses, police and other trained services workers (15% negative); 60% among students (19% negative) and 46% among professionals and senior government officials (35% negative). Among business managers and executives 30% are positive, 57% negative. Business proprietors and self-employed have a different outlook: 44% positive, 26% negative. two parent families with three or more children at home (62% v 27%). Those on highest personal incomes are least positive. 68% of those earning between $100,001 and $150,000 are not positive, while 22% are. However, among all other income groups more are feeling that the effect will be positive rather than negative, with peaks of 55% among those earning between $50,001 and $70,000 a year (26% negative) and 53% among those earning less than $20,000 a year (18% negative). Full tables can be downloaded here. Results are from a nationwide omnibus of 1068 adults representing the New Zealand adult population at the last census. Weighted by age, gender, ethnicity, personal income, region and party voted for in 2017, at a 95% confidence level the maximum margin of error is +/- 3%. Your comments are welcome at our Facebook page. For further information please contact Grant McInman, Manager, Horizon Research, e-mail gmcinman@horizonresearch.co.nz, telephone +64 21 076 2040.